“What goes up must come down”, the saying befits the Bitcoin as it dived more than $300 since the Chinese government banned ICOs last week. This fall comes right after a record high of $5000 over the previous weekend. This dip has led experts to despair over the future of Bitcoin and crypto currencies in general. What puts an even bigger question mark on the credibility of the best known crypto currency in circulation, are the recent remarks made by JP Morgan Chase CEO Jamie Dimon, at an Investor Conference in New York. According to Bloomberg Technology, Dimon said: “it’s (Bitcoin) a fraud” and “worse than tulip bulbs”. Considering Dimon’s remarks come exactly a week after Bitcoin’s price drop, it got us wondering about crypto currency mania. Even after last week’s events, majority of Bitcoin investors still believe it to be too early to draw a conclusion. Many claimed the banning of ICOs by China had nothing to do with the dip. However, there were reports noting that most of the ICOs are raising funds for crypto currencies that exist only on paper and are siphoning off billions of dollars from the economy. The fall in Bitcoin is attributed to this ban and many pundits are of the opinion, this could spell doom for crypto currencies. To understand the ‘whys’ and ‘hows’, let’s dig a little deeper. First things first, what is an ICO? ICO stands for Initial Coin Offering, which is a form of an unregulated structure that works in the field of fund raising for a new cryptocurrency venture. To put it simply, ICO sells a percentage of the cryptocurrency to early backers of the project against legal tenders or other existing cryptocurrencies (Bitcoin, Ethereum etc). The ban on ICOs in China comes in the wake of scams. A lot of new cryptocurrencies were sold off to early backers, which never came into existence. It is similar to scams, where a realtor charges you in full but the construction never starts. The scams went undetected for a long, as those involved in the transactions were either unregulated or the transactions were made through other digital currencies. For a better understanding on cryptocurrencies, let’s take you back in time when it all started. When did Bitcoin, Ether and other crypto currencies come into being? In the absence of unanimity over the actual discovery time of cryptocurrencies, Bitcoin is considered as the most important asset among them. Experts pronounce the time before the existence of Bitcoin as BBTC (Before Bitcoin). In 2009, Bitcoin became the first decentralized crypto currency. Bitcoin and its derivatives are not controlled by centralized electronic and/or banking transfer protocols. Instead, it uses Blockchain, the shared ledger technology. With the recent ‘hard fork’ in Bitcoin, a new currency form known as Bitcoin Cash has also evolved. As Bitcoin became the ruling decentralized currency, Ethereum started burgeoning with an aim to become a decentralized internet with volunteers cooperating as nodes. Though it’s not owned by anyone, it’s not free and requires Ether (the unique code) to compute anything. Ether is like Bitcoin, which is a bearer asset, like cash, and its transaction doesn’t require any authorization from third party. Currently, there are hundreds of cryptocurrencies available on Internet, which are decentralized. Apart from BTC and ETH, Ripple (XRP), a real-time gross settlement (RTGS), is a decentralized network, built upon a distributed open source IP in 2012. Likewise, Litecoin (October 7, 2011) and Peercoin (August 12, 2012) are other popular cryptocurrencies available for investment purpose. Why did crypto currencies, particularly Bitcoin, become so popular? There have been series of incidents that drove Bitcoin to a different level. Firstly, the community of enthusiasts who believed in the vision of Bitcoin and got motivated by seeing the success of peer-to-peer content distribution of BitTorrent. When Bitcoin went bull (rising prices), average people got curious and started investing in it. This saw a further boom in Bitcoin prices. The demand and supply chain became lopsided. Bitcoins were limited, its demand high and prices shot up. Moreover, Japan legalized Bitcoins and recognized it as a commodity. This was the time when the price started to skyrocket and Bitcoin became the ‘new Gold’. Bitcoin’s legalization by Japan played the most important role in its acceptance by various shopping portals. In the first weekend of September this year, Bitcoin hit a record high of $5000. People who never even had digital wallets, started enrolling for Bitcoin wallets so they could invest. Even after knowing the volatility of Bitcoins, people continued investing in BTC. It has reached a total worth $76,741,179,551 and counting. How did Bitcoin come to be valued so highly in recent times? Bitcoin experienced a ‘hard fork’ in the beginning of August 2017, which split the blockchain forming the new Bitcoin Cash or Bcash. Although, this split initially caused a dip, BTC flew to a record high just a month later. Cyber criminals – particularly Ransomware authors – play a major role in driving the BTC prices as they demand millions in the form of Bitcoin. Recently, hackers demanded Bitcoins as ransom from HBO in exchange for hacked content from the insanely popular TV series Game of Thrones. Most of the incidents involving Bitcoin, have been the drivers of the Bitcoin value. Since it is one of the most (seemingly) trustworthy and promising cryptocurrencies, even the Chinese ban on ICOs couldn’t hit it hard and it is still sailing proudly above $4600. What has the ban on ICOs got to do with Bitcoin and other crypto currencies suffering a backlash? The price dip looks like a direct fallout of the crackdown on ICO. Even Ethereum- the second largest crypto currency – saw a dip in valuation. The ban comes after a recent surge in crypto currency-related market trends in China. Apparently, the first half of the year alone raised more than $1 billion for blockchain-based projects. Most of these projects are nothing more than white papers. That’s a lot of theory on ‘disrupting various industries with new kind of Internet money’. This ban may be a pioneer to the series of blacklisting exchanges and services supporting cryptocurrencies. No government would want their money to be used somewhere they have no control. On the other hand, once the money disappears from the sight of government, it can be used/misused anyway the person wants. The billion dollars flowing away from the mainstream of the nation’s economy is always a matter that warrants strict actions. If not today, someday soon the governments of different countries will come along to clear the decks. A common enemy often unites! ICOs going out of control is a hard fact. There are various soft reasons like probable Internet money scams, danger to retail investors (the ban is a preemptive measure to ward off bigger financial worries when the crypto bubble bursts), and a lot of other factors intrinsic to China. However, just because China is the first to act doesn’t mean USA is not privy to threats the crypto currency mania poses. Have there already been cases of fraud and money laundering concerning crypto currencies? You bet! Let’s give you a brief on the most talked about cases from the pile of frauds of crypto currencies. On August 24, 2016, a federal judge in Florida certified a class action lawsuit against a non-functional cryptocurrency exchange organization named Cryptsy and its owner Paul Vernon. The person is accused of misusing the millions of dollars, which were user deposits, evidence destruction and believed to have fled to China. On December 1, 2015, the owner of the GAW Miners (defunct) was accused to masterminding a Ponzi scheme of cloud-mining, where he sold hashlets for 19 million USD. When in fact there were no miners actively mining cryptocurrency. In February 2014, cryptocurrency was all over the national headlines as the world’s biggest Bitcoin exchange declared bankruptcy. The company stated that they’d lost more than $473 million of their users Bitcoins due to theft. This news made the Bitcoin drown to $400 from $1160. GBL, a Chinese Bitcoin trading exchange, shutdown the business overnight on October 26, 2013, which left its users unable to log in and made them lose around $5 million worth of BTC. These are not the only cases of fraud and money laundering. Apart from these incidents, the usage of cryptocurrencies in dark market like Silk Road, is also popular. Though the Silk Road was shut down in October 2013, the Silk Road 3.0 is what is being used presently. If Bitcoin is still going strong, how is crypto currency going to die down anytime soon? Coupled with Dimon’s apprehensions, we have Market Watch Columnist Brett Arends warning investors. In one of his columns Arends surmises this (dive of $300) isn’t another ‘passing cloud’. Further, after Dimon’s remarks Bitcoin prices slipped another 2.7 per cent. Now, that’s a sharp drop for any market! This is not the first time that naysayers are predicting the end of crypto currencies. However, what sets the ICO ban apart from previous incidents, are the implications that have been sent out to the discerning investors. It’s not just about China, many other nations have warned about cryptocurrencies. It may be flourishing and blooming but eventually, Governments are not going to sit idle and see it nurturing. This has a lot to do with tax evaders and the acceptance of this decentralized money over many portals which offer ‘any service’ you may desire. Although, the concept of decentralized currency is a fact, governments may not be able to ban the currency. 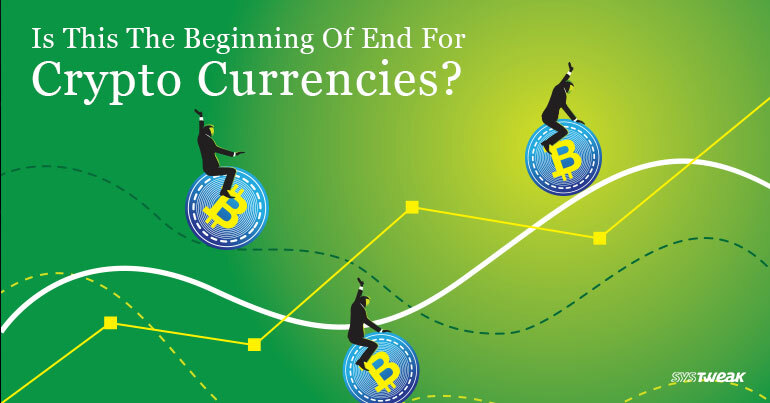 However, they have the control over the exchanges and trading platforms, which may be set on fire anytime and the conversion of cryptocurrencies to any legal tender can be demolished at a swish. To conclude, it does look like the beginning of end for cryptocurrencies. Invest wisely, if you are still not convinced. Apple Unveils iPhone 8 and 8 Plus: But What’s New With It?